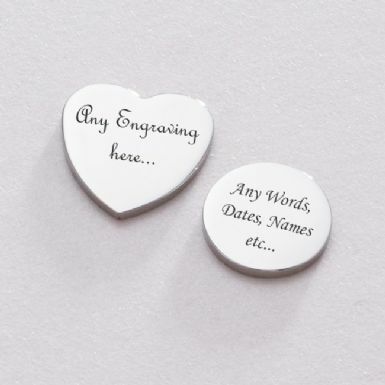 Stainless Steel Heart or Round Charms, No Loop with Engraving Included. Suitable for our Glass Locket necklace. Not suitable for charm bracelets as there is no loop to attach it with. These lovely charms, which are part of our range of remembrance jewellery, are made from high quality stainless steel which is hard wearing, bright, shiny and tarnish proof. Choose a heart or disc shaped charm. Part of our range of jewellery bereavement gifts. Size: Heart 17mm x 17mm. Disc 13mm x 13mm.